When you have finished setting up your course, you are ready to build your course content. This section provides an outline of the steps involved in developing your course content, with links to more details. Before you begin, you should understand the building blocks of an edX course. The course outline is the container for all of your course content. The outline contains one or more sections. Course sections are at the top level of your course and typically represent a time period. A section contains one or more subsections. Course subsections are parts of a section, and usually represent a topic or other organizing principle. A subsection contains one or more units. Course units are lessons in a subsection that learners view as single pages. A unit contains one or more components. Course components are objects within units that contain your actual course content. Once you understand the way edX courses are structured, you can start organizing your content and entering it into Studio. You create sections, subsections, and units in the course outline. For graded subsections, you also set the assignment type and due date. You create components in the unit page. 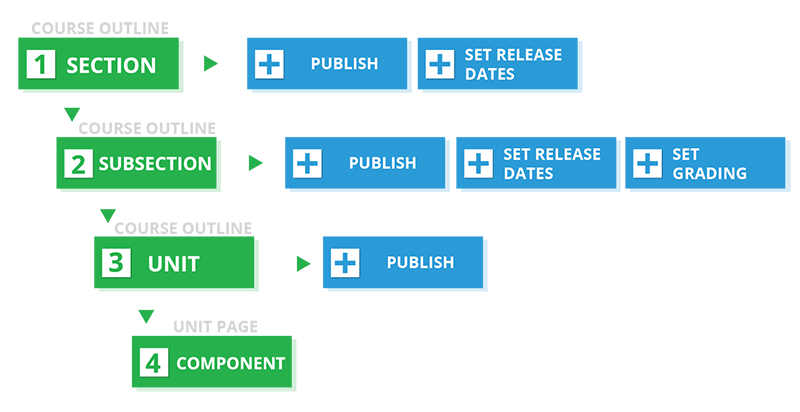 In addition, you control content visibility by setting release dates on the outline and publishing units. It is recommended that you test course content throughout the creation process, including making sure that the content is available for learners who access courses using the edX mobile apps. For more information, see Designing Your Course For a Mobile Experience. Keep in mind that course updates that you make might take longer to appear in the edX mobile apps than on the edX site. In particular, newly published content can take up to an hour to update on the Android app. 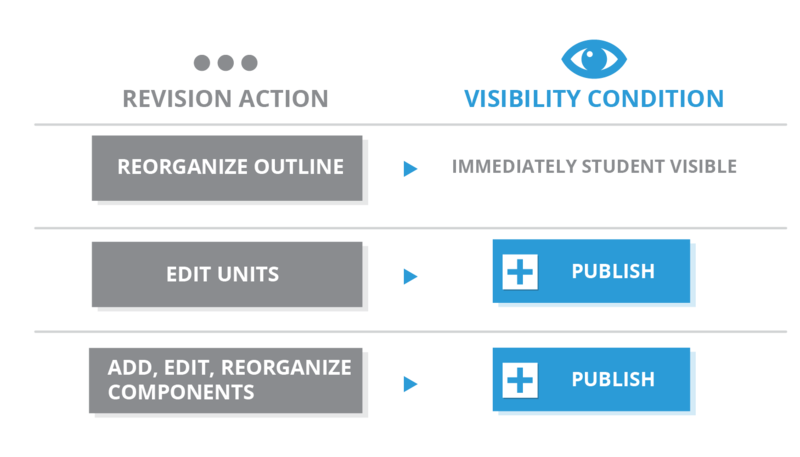 Course content visibility depends on the following factors. The release dates of the section and subsection. The prerequisite subsections that you configure. The publishing status of the unit. The Hide content from learners setting. The content groups or enrollment track groups that you have allowed to access the content. The use of the Results Visibility setting. You can revise your course content at any time. When you reorganize sections, subsections, and units in the outline, the new order is immediately visible to learners if the section and subsection are released. When you edit a unit, or components within a unit, you must publish those changes to make them visible to learners. It is recommended that you test course content during the revision process, including making sure that the content is available for learners who access courses using the edX mobile apps. For more information, see Designing Your Course For a Mobile Experience.